Professors can seek funding fo.. The next generation of leaders will learn the skills that will drive them to success at MTSU’s Blue Raider Leadership Summit. Subtitled “So You Think You Can Lead,” this one-day opportunity is scheduled for 9 a.m. to 4 p.m. Saturday, Feb. 1, in the Student Union ballroom. Click on the graphic above for more details on the 2014 summit and to register. “There will be a variety of presentations and interactive activities to appeal to different students’ learning styles,” said Jackie Victory, director of the Office of Student Leadership and Service. This year, students can choose from three concurrent tracks: emerging leadership, women’s leadership and Greek new members. 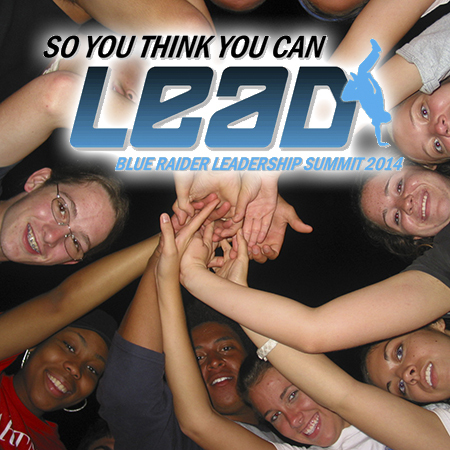 The Blue Raider Leadership Summit is sponsored by the Office of Student Leadership and Service and co-sponsored by the Intercultural and Diversity Affairs Center, the June Anderson Center for Women and Nontraditional Students and Fraternity and Sorority Life. Time is running out to take advantage of the early bird registration fee of $15; that deadline is Friday, Jan. 17. The rate for those who register between Jan. 18 and Jan. 24 is $20. The registration fee includes all meals and conference materials. All applications are due by 4:30 p.m. Friday, Jan. 24. in Room 330 of the Student Union. A downloadable registration form is available here. For more information, contact Victory at 615-898-5812 or jackie.victory@mtsu.edu or visit www.mtsu.edu/leadandserve/BRLS.php.